The label industry was first impacted by digital printing in 1993 with the introduction of the Indigo Omnius digital press. While the Indigo label press employs an ink based digital/offset print technology, other systems include toner based, heat fusion technology or direct ink jet printing, either water based or UV cured. Flexography or “flexo,” a more traditional print technology developed in the early 1900’s, utilizes flexible relief plates and semi liquid inks, either solvent based, water based, or UV cured. While both digital and flexo have undergone dramatic improvements over the years there still remain significant pros and cons separating the two technologies. Very high print quality, equivalent to 200+ line screens. Minimal set up time required by virtue of the digital process. Very slow press speeds in comparison to flexo. High quality digital in full color typically runs at 50 – 100 fpm. High initial cost and maintenance cost of equipment. Color gamut typically limited to capabilities of CMYK or four color process printing. Substrate limitations due to ink compatibility or heat associated with laser printers. Finishing, i.e. over varnishing, die cutting, etc., is typically done offline to conserve valuable press time. High press speeds, typically 200 – 300 fpm for quality full color printing. Ease of printing exact PMS spot color matches as many modern flexo presses are equipped with 8 or more print stations. All printing and converting processes including priming, over varnishing, laminating, and die cutting done in-line or single pass through the press. Ideally suited for longer runs. High cost of printing plates, usually $75 – $100 per plate, although plates can be re-used for repeat jobs and will last for millions of impressions if properly cared for. 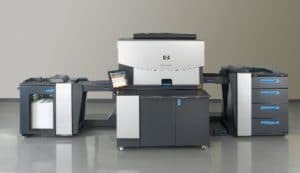 Lengthy set-up times required, typically several hours or more for a complex job incorporating CMYK plus several spot colors, varnish, laminating, die cutting, etc. High cost of set-up substrate waste often consuming 1000 feet or more of expensive label stock. In 1998 a committee comprised of Flexographic Technical Association (FTA) members and the Technical Director of Indigo America conducted a study comparing the manufacturing costs of printing and converting pressure sensitive labels by the conventional flexo process to the digital imaging process. Their conclusion at that time was that the “cost curves,” assuming four color process printing, crossed at about 3500 feet of printed material with digital being the more cost effective below that point. With increases in digital press speeds and decreases in consumable costs the point at which flexo becomes the more cost effective technology is now estimated to be about 5000 linear feet of printed material. The label presses of the future will undoubtedly be hybrids of these technologies, combining the attributes of versatility, speed, and efficiency of flexo with the greatly reduced substrate waste and zero plate cost benefits of digital. *This article was written by Dennis C. Hulton, Vice President/General Manager, Valley Forge Tape & Label Co., Inc.